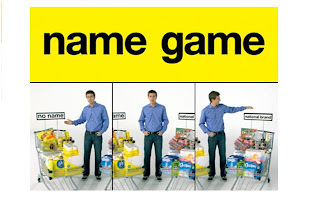 Retail Marketing Management: Loblaw is playing the No Name game, will you? Welcome to the the Ivey HBA Retail Marketing Management blog. Retail marketing is an exciting, dynamic, important, and very visible aspect of the overall field of marketing. Throughout the year, students will be posting comments regarding contemporary retailing issues. Although this is intended to be used by Bus 4411 students, industry marketing professionals are also invited to join in if they like. Loblaw is playing the No Name game, will you? The formation of this blog came from a recent conversation with my mother. She called me to ask “What in the world is Loblaw doing spreading that yellow No Name brand everywhere? I thought they were using Galen Weston’s haircut as the newest company fad?” I laughed because that dreadful haircut did get national attention. Since then, I've noticed that I'm being bombarded with Loblaw advertisements for their No Name product line in various media like newspapers, radio, and television. However, the visual design of this advertising campaign has lead me to question what consumer insights are driving the new brand direction, because clearly the yellow and black retro product focused ads aren’t encouraging any behaviours from me - other than to change the channel. Upon investigating the strategy behind the changes it is clear that the goal of the campaign is to show how far you can stretch your dollar, especially in tough times like these. As quoted by John Quelch, a Harvard professor, the article of focus describes the main consumer insight driving the change “private label consumption goes up during every recession as people trade down from national brands”. I think it is clear recent changes to the company’s retail value proposition have shifted the focus back to their private label brands. Interestingly, Loblaw is putting their money on the No Name brand rather than the traditionally favoured premium positioned President’s Choice line. The reason – Loblaw is hoping that consumers’ desire for the lowest priced goods will bring them onboard with the No Name game too. Personally, I think that the print advertisement that show a basket full of No Name products is priced equivalently to a half full basket National brand highlights achieves the goal of highlighting the value of No Name products. Another TV commercial shows that a basket full of the top 26 selling No Name products costs $73.91, while the basket of 26 comparable national brands comes in at $100.38. Clearly, Loblaw is betting that promoting the price saving is critical in this new age of grocery shopping, where consumers are forced to save pennies on even the most basic of shopping trips. The response from representatives of national brands is nothing less than expected. They are fighting back by highlighting their own RVPs, which place weight on experience and selection over low prices. Nancy Marcus of Kruger Products highlights the No Name ad “reinforces the view that No Name is a value brand that competes only on price.” They reinforce that there will always be people that will remain national brand loyal even during a recession because these people make sacrifices in other parts of their lives in order to have that specific type of Cashmere toilet paper. However, after successfully seeing past the neon yellow advertisements, I have decided that I am definitely willing to play the No Name game. After all, as a consumer I see few perceivable differences in basic commodities like flour, butter, and salt. Do luxury stores have a future? Wal-Mart's New RVP: The Shopping Experience?